THE TRUE STORY OF HOW THE INTERNATIONAL BANKSTERS DESTROYED OUR CONSTITUTIONAL REPUBLIC . . . FROM WITHIN! 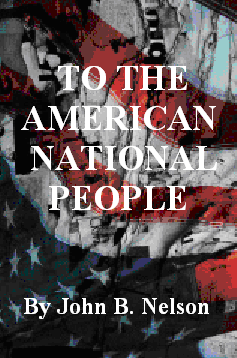 In 1991 John B. Nelson released a truly amazing document addressed to The American National People and The People of the State of Colorado regarding “Senate Report 93-549, Etc” exposing the permanent state of national emergency and its ramifications. Nelson tracked down and sited legislation and documents proving beyond any doubt that the international banksters (the IMF, the World Bank and the BAR) had bankrupted the country and replaced our legal system (by stealth) with the Uniform Commercial Code. John Nelson’s work could easily be used to validate many of Judge Dale’s conclusions in his The Great American Adventure. I have enclosed Senate Report No. 93-549, 93rd Congress, 1st Session (1973), “Summary Of Emergency Power Statutes”, consisting of 607 pages, which I believe you will find most interesting. The United States went “Bankrupt” in 1933 and was declared so by President Roosevelt by Executive Orders 6073, 6102, 6111 and by Executive Order 6260 on March 9, 1933, under the “Trading with The Enemy Act”, and as codified at 12 U.S.C.A. 95a. The Council Of State governments has now been absorbed into such things as the “National Conference Of Commissioners On Uniform State Laws”, whose Headquarters Office is located at 676 North St. Clair Street, Suite 1700, Chicago, Illinois 60611, and “all” being “members of the Bar”, and operating under a different “Constitution and By Laws”, far distant from the depositories of the public Records, has promulgated, lobbied for, passed, adjudicated and ordered the implementation and execution of their purported “Uniform” and “Model” Acts and pretended statutory provisions, to “help implement international treaties of the United States or where world uniformity would be desirable. It appears from the documentary evidence that the Internal Revenue Service Agents. etc., are “Agents of a Foreign Principal” within the meaning and intent of the “Foreign Agents Registration Act of 1938.” They are directed and controlled by the corporate “Governor” of “The Fund” [International Monetary Fund] a/k/a “Secretary of Treasury”, and the corporate “Governor” of “The Bank” [The World Bank], acting as “information-service employees” and have been and do now “solicit, collect, disburse or dispense” contribution, loans, money or other things of value for or in interest of such foreign principal . . . They have “fundamentally” changed the form and substance of the de jure Republican form of Government, exhibited a willful and wanton disregard for the Rights, Safety and Property of others, evinced a despotic design to reduce my people to slavery, peonage and involuntary servitude, under a fraudulent, tyrannical, seditious foreign oligarchy, with intent and purpose to institute, erect and form a “Dictatorship” over the Citizens and our Posterity. They have completely debauched the de jure monetary system, destroyed the Livelihood and Lives of thousands, aided and abetted our enemies, declared War upon us and our Posterity, destroyed untold families and made homeless over 750,000 children in the middle of winter, afflicted widows and orphans, turned Sodomites loose amongst our young, implemented foreign laws, rules, regulations and procedures within the body of the country, incited insurrection, rebellion, sedition and anarchy within the de jure society, illegally entered our Land, taken false Oaths, entered into Seditious Foreign Constitutions, Agreements, Pactions, Confederations, and Alliances, and under pretense of “emergency”, which they themselves created, promoted and furthered, formed a multitude of offices and retained those of alien allegiance to perpetuate their frauds and to eat out the substance of the good and productive people of our Land, and have arbitrarily dismissed and held mock trials for those who trespassed upon our Lives, Liberties, Properties and Families and endangered our Peace, Safety, Welfare and Dignity. The damage, injury and costs have been higher than mere money can repay.